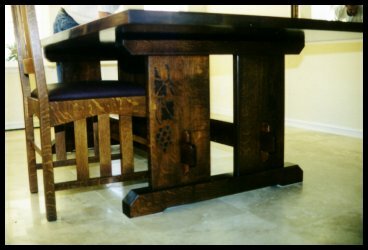 These photos are a sampling of the many Arts & Crafts inspired tables we have built. or Mission style built-ins or furnishings? This is not a problem. I will work with you or your designer to create just the right piece. We have over 30 years experience at matching styles and finishes.
" Modern Mission " A modern interpetation of Limbert design at it's best! This coffee table combines every day function with a unique Arts & Crafts flair. 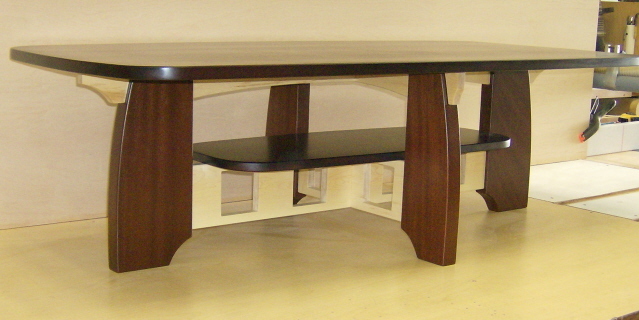 Rosewood finish top and shelf, Mahogany finish legs and natural finish stretchers. 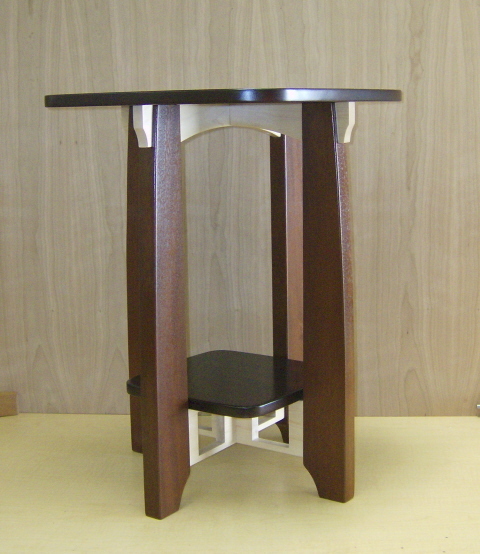 Size 54" x 26" x 16"
Another " Modern Mission" design. Companion to the coffee table this end table echos all the same elements. Size : 26" high with a 20" x 20" top. 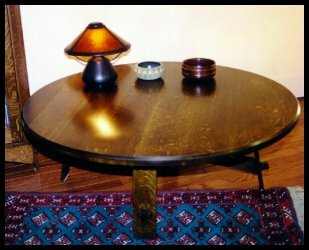 Functions as cocktail, end or lamp table. 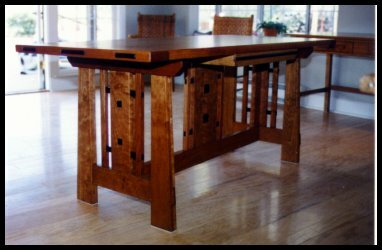 Arts & Crafts Trestle base Dining table. Expands in the round. 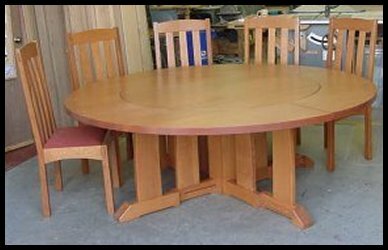 This very unique table is 54" diameter closed & 84" diameter with the leaves. Made entirely with 8/4 thick stock. This is a Heart of Oak Workshop exclusive design. 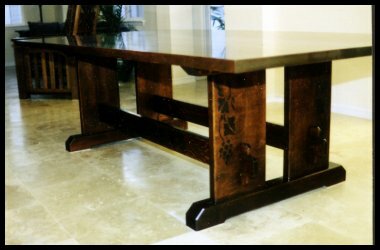 Custom Mission style trestle type Dining Table. Truly Massive! Heart of Oak Workshop exclusive Design. Made entirely of 8/4 Quarter sawn white oak. 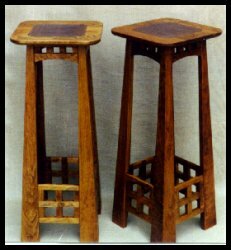 This example has relief carved detailing of an Arts & Crafts "grape leaf" motif in legs and stretchers. 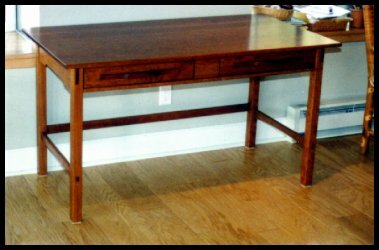 This table can be made with sliding trestle assembly and leaves for larger applications. Solid American Black Cherry with Ebony accents. Absolutely beautiful lines! 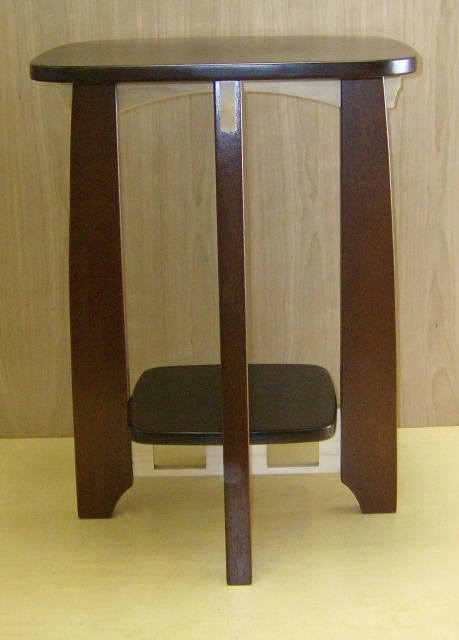 Available in a variety of sizes in Mahogany, Cherry or QSWO. 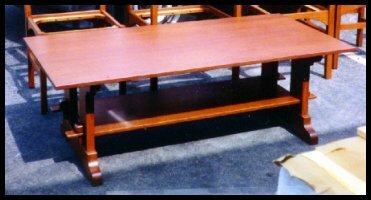 Available in Cherry or Mahogany and custom sizes & configurations. 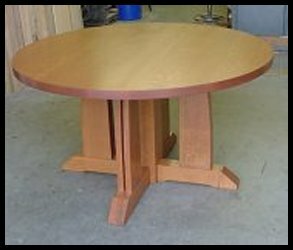 Roycroft inspired round Coffee table in quarter sawn white oak. Features through tenoned display shelf below.